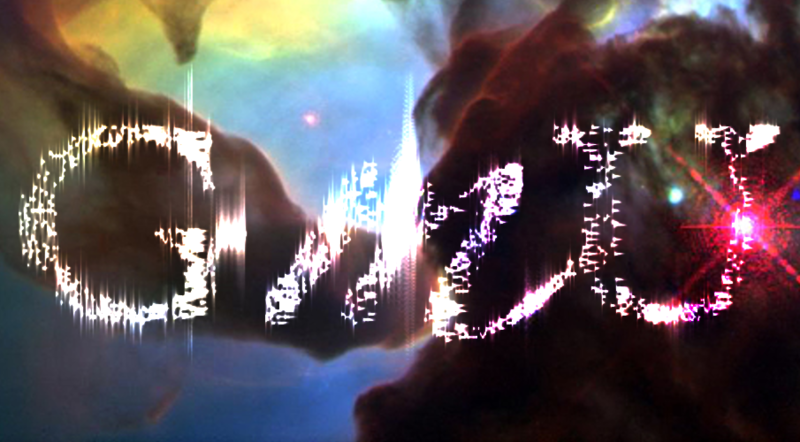 GMU is a software environnement dedicated to advanced granular synthesis. 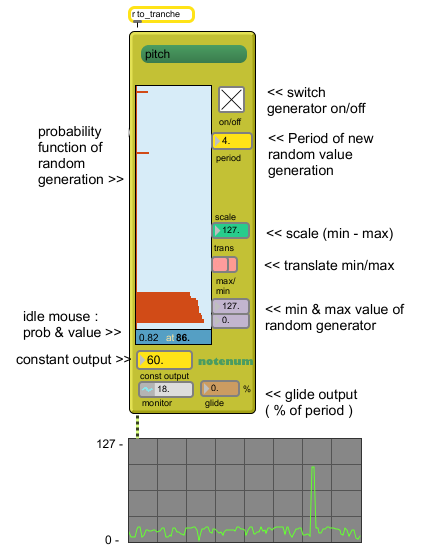 It includes both real-time synthesis tool in MaxMSP and offline granular analysis/synthesis techniques. 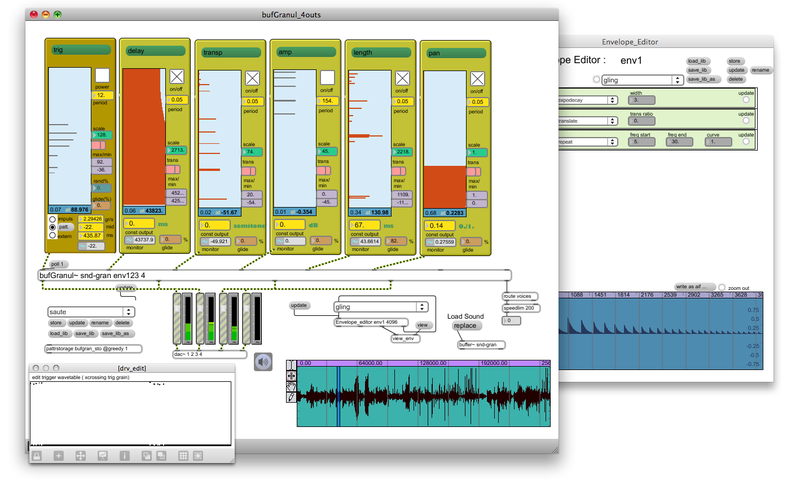 GMU for MaxMSP is a set DSP objects and patches for advanced real time granular synthesis. bufgranul~: sound multi buffer granulation with signal form parameters and buffer based envelope. 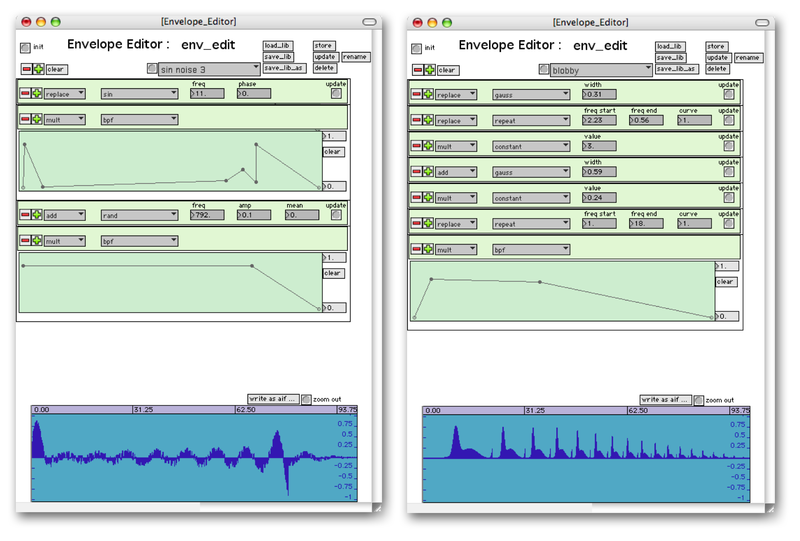 livegranul~ : live granulation with signal form parameters and buffer based envelope. singranul~ : sinusoidal granulation with signal form parameters and buffer based envelope. 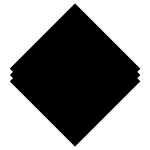 Grains are triggered either by signal zero-crossing or messages. Each grains can be individually panned on 1-2-4-6 or 8 outputs. These objects can handle large polyphony of grains ( 512 grains on 2.5Ghz macbook pro ~ 50% dsp). It was interesting to take advantage of system abstraction synthesizer envelope (envelopes are defined as a table of values). Indeed, the shapes of envelopes directly influence the timbre of the sound and editing extends the sonic possibilities. We have developed a modular system to create envelopes. This is actually a « stack » of generative or transformative functions which combines themselves in different ways. The editor allows saving combinations of functions in pattr compatible presets recallable by the synthesizer. The figures below show two examples of combinations.